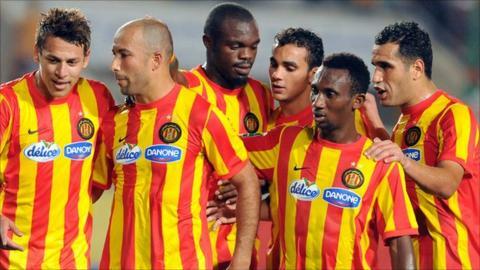 Holders Esperance of Tunisia drew 0-0 with DR Congo outfit TP Mazembe in the first leg of their Champions League semi-final tie on Sunday. In a match of limited opportunities, a draw was perhaps the fairest result. Mazembe, though, finished with 10 players on the pitch after Stopila Sunzu was sent off in stoppage time for a second bookable offence. The goalless affair in Lubumbashi sets up a potentially explosive second leg in Tunisia in a fortnight. The winners will play either Sunshine Stars of Nigeria or Al Ahly of Egypt in the final. Sunshine and Ahly produced a thrilling 3-3 draw in Nigeria on Saturday, making the Cairo Red Devils favourites to go through. TP Mazembe and Esperance have shared the last three Champions League titles between themselves, with the Congolese side winning in 2009 and 2010. They were denied a chance to secure a hat-trick of titles when they were disqualified from the competition last season after fielding an improperly registered player.